Taking care of your car is one of the most essentials things that you have to do. This machine gets you to work, to friends, and your favorite restaurants. You want to make sure that your car can reliably get you to and from these locations. To do that, the Auto Maintenance Chart can help you keep track of the parts and services recommended to you by a professional. Not only will you be able to monitor the oil changes and regular maintenance of your vehicle, but you can also store helpful recommendations from mechanics that you couldn’t get to right away. Read more about this amazing template below, to take better care of your vehicle. You will need to click the link at the bottom of this page to download the free template file to your computer. The next step is simply to enter your recent services. You can either keep this document on your computer or you can print out a few pages to write these things down by hand, it’s completely up to you. To print your new template just Click “File” then “Print” at the top of your screen. There are a few columns in which to enter your information. The first is the date in which you had your car serviced. The next column lets you list any notes on that service, such as a small description. You will then notice a selection of services and mileages across the top of the page. These are recommended services that your vehicle should have done after they reach the designated mileage. Once you receive one of these services, just enter your current mileage under the corresponding column to indicate that particular service has already been rendered. When you go through the entire selection of services, you can start a new row and begin the cycle over again. 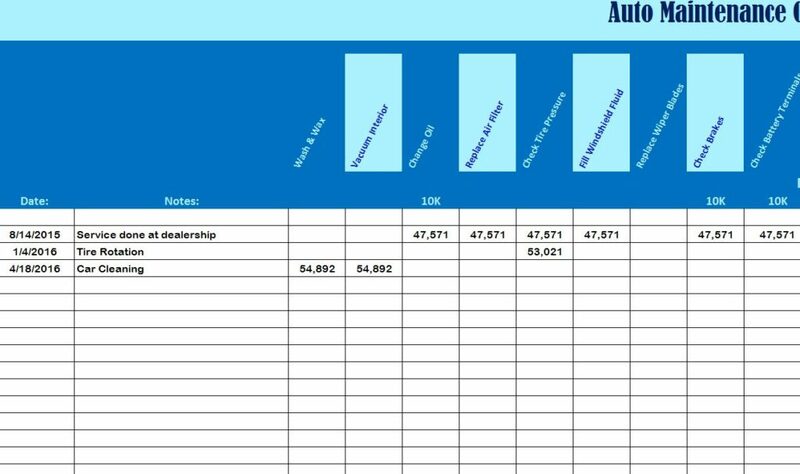 Keeping your car like new has never been easier with the Auto Maintenance Chart.